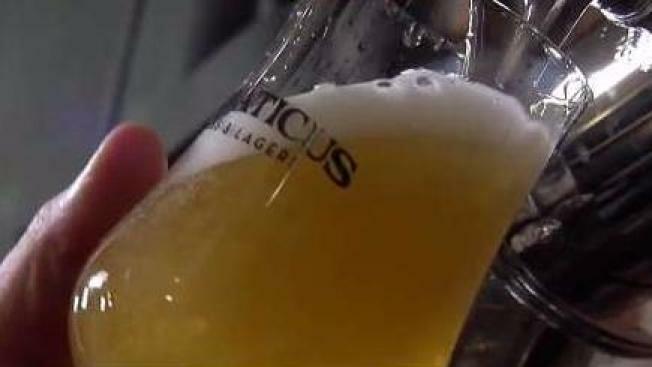 Silvaticus Brewery just opened in Amesbury, Massachusetts, but already it’s a huge hit! Silvaticus Brewery just opened in Amesbury, Massachusetts, but already it's a huge hit! "It's not an accident that we’re here. Amesbury is a beer town. I’ve always said a beer town without a brewery — that’s not the case anymore," said Mark Zappasodi, one of the co-founders. Zappasodi started the new brew house with his long time beer buddy Jason Bullen. Both shared a love of European influenced beers, specifically traditional pilsners, farmhouse ales, and lagers. "We want to have a more old world feel," said Bullen. That feel also extends to their brewery design. There are no TV's in the brewery on purpose. "We wanted to take that away and force people into conversation a little bit more," said Zappasodi. The brewery doesn’t have a full kitchen, but they do offer small bites. Everything from locally sourced cheeses, meats, soft preztels, and whoopee pies. You won't find Silvaticus beer in stores yet, but customers can take home "crowlers" canned in house. They're 32 ounces of beer, which are overfilled to ensure a tight seal, and freshness. Silvaticus Brewery is located at 9 Water St. in Amesbury.